Tuning performed by db2tune8 scripts in the archive/Schema/Database_1 directory. Tuning performed by db2tune8 script in the archive/Schema/Database_2 directory. Four ServeRAID 6M controllers each connected to separate EXP400 Storage Units each with 14x36.4GB 15K Ultra320 SCSI disks. See diagrams: db_tables.JPG and db_logs.JPG in the archive. Two ServeRAID 6M controllers each connected to separate EXP400 Storage Units each with 14x36.4GB 15K Ultra320 SCSI disks. See diagrams: db_tables.JPG and db_logs.JPG in the archive. which is Cursor Stability (CS) for DB2. or wsPessimisticWeakestLockAtLoad) (which translates to DB2 isolation level of Read Stability (RS). storage for database system #1 increased 678 MB; database system #2 storage increased by 1028 MB. for database system #1 by 10848 MB and database system #2 by 16448 MB. The EXP 400 Disk enclosures each contain fourteen 36.4GB drives. two RAID 5E arrays of 7 drives each. This yields a total disk storage of 419879 MB for each EXP400 storage unit. WebSphere Application Server V6.0 uses pass-by-value semantics by default. IBM Load Balancer balanced HTTP connections across the WebSphere nodes. 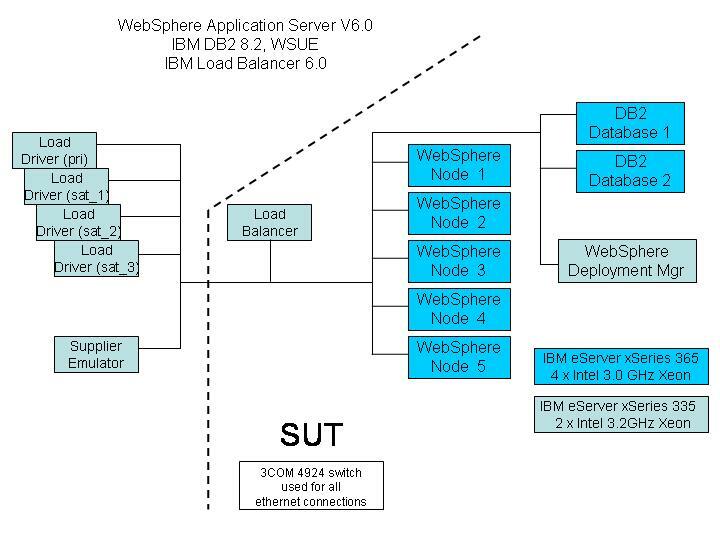 with WebSphere Application Server V6.0 in the IBM 1.4.2 JDK. The IBM DB2 Universal JDBC Drivers (XA and non-XA) is a type 4 driver. instances, and between database server and JMS servers.